The Illinois DOT TAMP is available here. 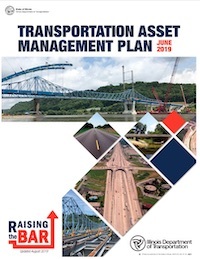 The Illinois DOT TAMP describes how Illinois DOT plans to use performance data to drive investment decisions that align with national transportation asset management initiatives. To do this, the plan supports the use of strategic performance objectives; introduces a systematic process that links investments to performance objectives; emphasizes the use of preservation treatments that extend the life of the highway system at a minimum practicable cost; considers agency risks or exposure in setting investment priorities; and uses asset inventory information, asset condition data, and analysis tools to evaluate options for allocating resources and strategically selecting projects.